Posted on January 25, 2019 at 12:33 pm. Crossing Guard Appreciation Week, coordinated annually by Virginia Safe Routes to School and celebrated at schools across the nation, recognizes the role of crossing guards as a critical link in the Safe Routes to School network. 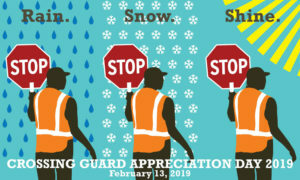 Arlington Public Schools’ 2019 Crossing Guard Appreciation celebration will take place during the week of February 11-15. During Crossing Guard Appreciation Week and every other week of the school year, APS depends on the Arlington County Police Department’s Crossing Guard Unit to help students get to school safely. Each day, 25+ crossing guards fan out to 44 posts at elementary and middle schools around Arlington County, with most guards covering more than one school at both arrival and dismissal time. In addition to supporting students who walk and bike, Arlington’s guards also help ensure that school bus riders arrive at school safely. Crossing Guards are on the job every school day, in all weather conditions. With limited daylight hours, cold temperatures and often treacherous conditions, February can be one of the toughest times of the year for guards. 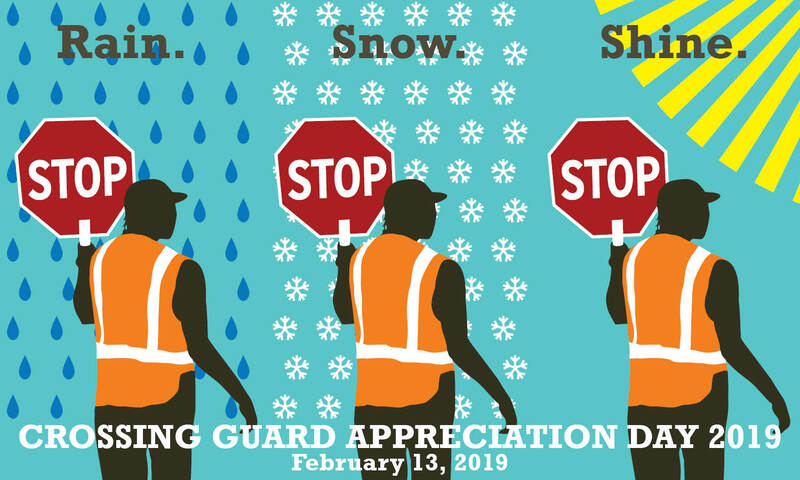 Crossing Guard Appreciation Week is a way to remind them how much we appreciate and value their service–in February and throughout the year. Write thank you notes from parents and school staff; deliver in person or send in with students. More ideas for how your school can celebrate are available in the Safe Routes to School guide entitled Crossing Guard Appreciation Day Learn It. Do It. Live It guide. Downloadable flyers, posters, graphics, stickers, cards and other ready-made resources to help schools honor these committed individuals by celebrating Crossing Guard Appreciation Week can be found on the Virginia Safe Routes to School website. As part of the week-long celebration, the Virginia Department of Transportation (VDOT)/Safe Routes to School will recognize Virginia’s Most Outstanding Crossing Guards. Last year, Arlington’s own Almaz Abebe was one of six honorees state-wide, thanks to a compelling nomination submitted by a family from Kenmore Middle School. VDOT will announce the Most Outstanding Crossing Guards for 2018-19 one week before Crossing Guard Appreciation Week. For more information on Crossing Guard Appreciation Week 2019, please contact APS Safe Routes to School Coordinator Lauren Hassel at lauren.hassel@apsva.us.